Editor’s note: I’m T-minus 48 hours from ending my current exile (parents versus old age) to Southwestern Ohio and some of the most sprawliest sprawl and worst Mexican food you’ll ever encounter. 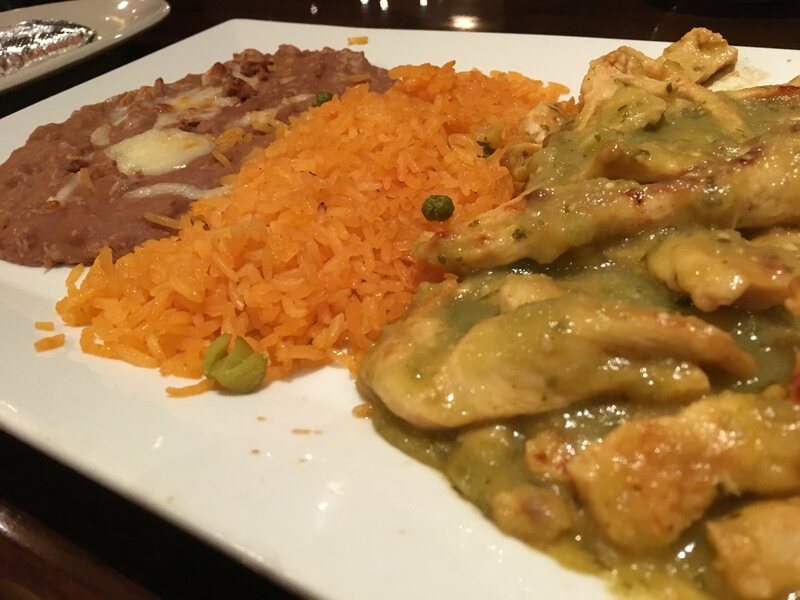 On the “El Rancho Grande” menu, the photo below was alleged to be “chili verde.” To say the least, I cannot wait to reoccupy my Government-Issued Cubicle on Thursday afternoon and visit Yxta this coming weekend. Photographed and partially consumed by Steve Hymon. On a more positive note, I look forward to Dodger Stadium Expressing it to the Dodgers-Reds games at Chavez Ravine in May. I think there’s an excellent chance the Reds won’t fall into last place in the NL Central until late June. Speaking of the Dodger Stadium Express, service resumes this week from Union Station and Harbor Gateway. Below is our new promotional video — that last bus operator got some serious bat on the ball. Candidates were asked at a debate in Los Angeles (Gavin Newsom was not present) about SB 827, the state bill that would require cities to allow a lot more density in neighborhoods near frequent transit lines. The intent of the bill earned praise, but several candidates said they could not support the bill as written. (We wrote about 827 yesterday). Of course, if the bill is approved by the Legislature in 2018 — and that’s a big ‘if’ at this point — it will be up to current Gov. Jerry Brown to decide to sign or veto. If the bill doesn’t make it this year but is revived and approved by the Legislature in 2019, then the hot potato lands on the future Governor’s desk. My three cents, as I wrote yesterday: any state bill that significantly upzones single family home neighborhoods around the state will likely face an uphill battle. The Los Angeles City Council just voted unanimously to oppose Senate Bill 827, which would allow four- to eight-story residential buildings to go up near bus and rail stops. Councilman @PaulKoretzCD5 called the bill "pure insanity"
One approach might be to find communities that are willing to encourage higher density in return for new mass transit lines. Communities located beyond existing lines could be approached to see if they are interested. Bus rapid transit like the system in Bogota, Columbia, or light rail like Portland, Oregon, or Jerusalem, Israel are relatively lower priced ways of building mass transit lines. Renters in high density communities might receive an income tax deduction for living in apartments. A variety of creative financing schemes and new forms of transportation could reduce auto miles travelled per capita–without inconveniencing people or impairing their quality of life. Interesting point although politically tricky to have transit lines skipping some cities or not having stations there. The gist of the piece revolves around the carrot or stick approach: is it better to let the state upzone entire neighborhoods or find a way to encourage cities to do it? Located on a 4.06-acre site in West Los Angeles, Linea provides easy access to light rail, restaurants, and retail, and is less than three miles from major districts, including Beverly Hills, Century City, and Westwood. The project is comprised of one 10-story building and three 6-story buildings, including 5,000 square feet of retail. The project’s 595 apartments offer lofty ceilings, floor to ceiling windows, and full-sized washers and dryers. Designer touches include wood-style flooring, stainless steel appliances, quartz countertops, modern cabinetry with upgraded hardware, and undercabinet lighting. A robust amenities package includes a 24-hour concierge service and Porte cochere entrance. 40,000 square feet of outdoor amenity space includes landscaped courtyards, outdoor barbecue areas, water features, bocce ball court, summer kitchens, and fire pits. Approximately 7,000 square feet of outdoor rooftop space features a resort-style pool with unobstructed views of the Pacific Ocean and coastline as well as fire pits, an outdoor kitchen with barbecues and al fresco dining areas. The clubhouse houses a media lounge, gourmet demonstration kitchen with stainless steel appliances, private dining room, flat screen televisions with gaming consoles, billiards and shuffleboard, and a lounge bar. A state-of-the-art fitness center boasts cardio equipment, fitness machines, flat screen televisions, and a spin room and yoga studio with Fitness-on-Demand technology. Bocce ball! I have no idea what the heck ‘Porte cochere’ is. No word on rents. As we posted earlier this year, the north half and south half of the Blue Line will be closed for maintenance for four months each (but not at the same time) beginning in early 2019. There will also be an eight-month closure of Willowbrook/Rosa Parks Station so that it can be rebuilt. Yes, there will be bus shuttles — both of the local and express variety. The idea will be to minimize any inconvenience and the Blue Line, as Curbed notes, should be vastly improved when it fully reopens in the second half of 2019. Good point — a bus taking longer to finish its route chews up agency resources. If the agency can’t add more buses to the system to keep frequencies from falling, then you’re basically dealing with a service cut. The North Korean leader is apparently fearful of flying and prefers this train, which is so weighed with security measures, food and a helpful staff (throat clear) that it can’t go more than 37 miles per hour. Fascinating read. My apologies if you are stopped by a pay wall on this one. The gist of the article: There are several regions — including ours — that want to test congestion pricing, i.e. tolls intended to discourage driving based on traffic levels. But everyone wants Gotham/Metropolis to go first to help provide some political cover. There is, btw, a bill before the Legislature in Sacramento that would allow two congestion pricing pilots to go forward in So Ca and two more in Nor Cal. The bills aren’t exactly teeming with supporters at this point, as the WSJ notes. A little protest music to fuel your Tuesday. One of the better versions I’ve seen of the best Bruce Springsteen tunes. Hey Bruce: bring your Broadway show to the Pantages so I can’t afford to see it locally!!! That GOR (Gross Orange Rice) looks drier than Badwater Basin. I’m sorry you had to suffer through that. Also, any place claiming to serve Mexican food that uses the spelling “chili” instead of “chile” is immediately suspect (the chain restaurant included). Would there be any way to add a stop on the South Bay Dodgers Express route for either 37th/USC or LATTC/Ortho Institute? This would allow Expo Line riders to use this service without schlepping to Union Station. I would much rather Metro would just shut down the whole Blue Line for 4 months, rather than shutting one half of it at a time (for a total of 8 months). Just do the halves simultaneously, and get it over with sooner. I’m all for Bill 827. However, I would suggest adding urban density in areas where bus lines don’t run frequently. ¿WHY? Well, building where transit is already frequent is a good idea don’t get me wrong; there’s a reason why such area has such high frequency so ‘not building’ near there won’t really hurt current ridership and affect future ridership. On the other hand, build where the buses (and perhaps rail) don’t have high frequency, give a fair priority/lower rent to tenants who will take the current transit to work, etc. Now, the obvious issue will be to encourage as many people as possible to hop aboard such a bus if, for the sake of comparison, the local metro or municipal bus services such area every half hour. However, if the bus can be partially full for every half hour that it arrives at such area for about a month (consistent ridership growth is the term I was looking for LOL) then the agency that operates such bus receiving the spurt in ridership should then recognize that more frequency & buses should be added there. Thanks to what? ; building urban density around there. My apologies. I was able to see the article as a freebie — without having to pay. I’ll put up note about the pay wall. The Blue Line closure again raises the question about why this is being done BEFORE the Crenshaw line opens? Perhaps Metro is considering running more supplemental buses along the harbor transitway during this blue line closure. if not, they should seriously consider doing this as its a parallel route not too much further west. Unfortunately, as is so often the case, Metro has not bothered to ask any of us who actually USE the Blue Line what our suggestions are for the most important improvements needed on this miserably inadequate rail line. As usual, Metro assumes that it is the font of all knowledge, and its passengers know nothing–which certainly contributes to the continuing loss of ridership on Metro’s buses and older train lines. Among the many MAJOR deficiencies of the Blue Line is the total inadequacy of the area (square-footage) of the station platforms (and entrance ramps)–from Washington on south–over which passengers must walk to and from trains, or (more likely) on which passengers must wait–and wait, and wait some more–for trains to arrive that so often fail to run according to Metro’s essentially fictional official schedule, especially at night during periods with 20-minute headways after 8:30 p.m. Compare these pitifully “skinny” Blue-Line station platforms with the commodious, even spacious station platforms on EVERY OTHER MetroRail line. Yes, I have heard the tired excuse by Metro that the right-of-way that Metro owns for the Blue Line is too narrow and the tracks too close together to allow for station platforms of decent width (like the platforms for all the other MetroRail lines). Even if one accepts that excuse, there is no logical reason that the sloping ramps between Blue-Line platforms and the adjoining sidewalk along most of the north-south route are EVEN NARROWER THAN THE STATION PLATFORMS! Hurrying to get onto a station platform to catch a train, or to get off the platform to the nearby bus stop, can be a bruising experience. Just two persons walking abreast in the opposite direction (or one person and a bicycle, walker, or wheelchair) can complete block these ramps. There is NO reason that Metro could not make these access ramps just as wide as the station platforms that they lead to/from, but apparently Metro staff haven’t yet figured that out. Metro should show a little humility and try asking its customers what they actually need the most. A Porte cochere is a roofed structure extending from the entrance of a building over an adjacent driveway and sheltering those getting in or out of vehicles. As a resident of Pasadena Steve Hymon must have seen the structure over the driveway on the right side of the Wrigley Mansion.